Overview : XFPS Fire Light Gun brings first person shooters to a whole new experience. With the XFPS Storm, you can snipe your foes with precision aiming using this unique light gun. No more keyboard, no more mouse and having to rest your wrist with point and click. Simply point and shoot. The Fire will support CRT, LCD, Plasma, DLP as well as Projector. It supports every gun shooting game on the PlayStation 3. Compatible with different versions of PS3/Slim consoles. Quality/Usability : Everyone loves the good ole point and shoot like Duck Hunt for the Nintendo Entertainment System (NES). Yes, there is Time Crisis but the gun only works for that specific game. What about first person shooters such as Tom Clancy's Ghost Recon, Call of Duty, Battlefield and many others? XCM plans to fill that void by releasing a peripheral gun that lets you aim, move and shoot. Its simply a gun and a controller in one. The Fire Light Gun feels comfortable in the hands and is light enough to be held in one hand. Attached to the side is a smaller grip that can be detached. Buttons can be found on the detachable grip and on the gun itself, on both sides. The right side of the gun contains the usual TRIANGLE, CIRCLE, SQUARE and X as well as a "S" button, ON/OFF switch for Turbo and L2 button. On the left side, there is a directional pad, PS home button, SELECT, START and R1 button. The front of the detachable grip has a L1 and IGNORE button. Both the gun and grip contain an analog stick that can be pressed in (R3/L3 respectively). In order for the Fire Light Gun to be recognized, it requires a sensor bar to be connected to the PS3 or a USB port similar to that of the Wii. You will also need to connect the gun to a USB port as well. So you will need two USB ports in order to use the Fire Light Gun. Whats great about this is that its all plug and play. The moment you plug it in, the gun is being tracked. You can even control the XMB with the gun but can get some getting use to and is a little sensitive. The analog stick on the grip moves your character while the analog stick on the gun controls the view. All the buttons are pretty much self explanatory as they perform the same functions as that of the controller. You can even program the SQUARE, TRIANGLE, CIRCLE, X, R1, R2, L1, L2, R3, L3, START, SELECT, directional pad and IGNORE buttons. To program buttons say for instance, R1 to R2 on the XFPS Fire Light gun, press the "S" button on the Fire Light gun once. The LED indicator will light up and than press R2. The LED indicator will start blinking, now press the R1 and the LED indicator will turn off. This means the programming is complete. The R2 button will now function as the R1 but the R1 button has remained the same and unchanged (now two buttons act as R1). If you want to set the R2 button to the R1, you can follow the same steps even though the R2 button is already programmed to function as the R1 button. To revert back to previous function, press the "S" button once. The LED indicator will light up. Press the R1 button and the LED indicator will start blinking. Rather than press R2, press R1 again and the LED indicator will turn off. This can be done for other buttons. To swap the analog sticks, press the "S" button and the LED indicator will light up. Push any direction on the RIGHT analog stick and the LED indicator will turn off. Now the function of both analog sticks has been swapped. If you want to set them back to their original function, just repeat the steps again. If you swapped a lot of buttons and dont want to go through each swapping, you can simply press and hold the "S" button for 3 seconds. The light on the LED indicator will blink quickly. This will indicate that all the buttons have returned to their original functions. Since there is no software to configure the gun, near the eye sight on top of the gun, there is a dial that lets you increase and decrease the X and Y axis sensitivity. For games with relatively simple control schemes, the game is fun. But with games that requires more buttons to access weapons, inventory list, etc., it requires some getting use to as to where the buttons are and the feel since you're probably use to the controller and its button layout. Accessing button on the gun can be a little hard especially when you have the nunchuk detached. Conclusion : Overall, the XCM XFPS Fire Light Gun. The XCM XFPS Fire Light Gun is very very similar to the XCM XFPS Storm Light Gun for the PC. Only difference is the color and markings on the buttons. It may take some getting use to in regards to button layout and trying to access buttons is a little hard when you're hand is already holding a detached nunchuk. Its perfect for games that dont have many button presses but for those games require lots of button presses to access weapons or inventory lists, hope you're fast and dont need to access them during a gun battle. 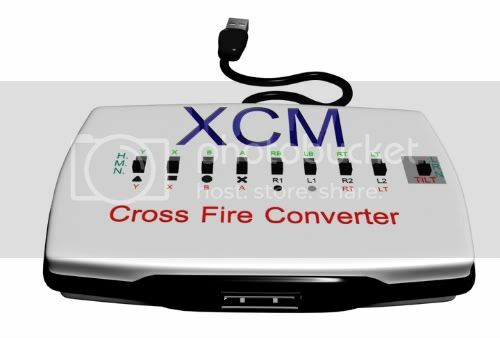 You can also use the XFPS Fire Light Gun on the Xbox 360 by using the XCM Cross Fire Converter.